I had always intended to email you and say thank you for my hair and make up but I never expected that you would be the person who actually got me through my wedding day. Before you arrived I had serious doubts that I would be well enough to go through with it and if I did I thought I would look tired and ill (which is how I felt!). Fast forward to your arrival and putting an emergency call through to your brother (who’s a pharmacist) and I not only made it to my ceremony but I had the best day of my life. So many people commented on my hair and makeup and when I told them about the state you had to work on me they could not believe the job you did. My make up and hair still look fab now and I am loathe to take it off. I felt like all brides want to on their wedding day and that is thanks to your expertise and your cool head in the face of a crisis. I cannot thank you enough for everything you did yesterday and you made me look and feel better than I ever have before. I will email you some photos when I get them back so that you can see your handiwork. A million thank yous will never be enough." Thank you so much for your utter professionalism and complete artistic talent on my wedding day. You totally surpassed by expectations and I received such glowing comments specifically on my make-up. You dealt with all the interuptions when styling my mother in law and then did me and my maid of honour with such calm efficiency despite my stressed and nervous disposition. The room was full of lots of people and distractions and you just carried on with complete calm focus. Any bride getting married would be very lucky to have you and I will certainly be recommending you to anyone I know getting married or even attending a special occassion. I felt a million dollars on the day and my photographs are lovely. Thank you again and again." " I just wanted to drop you a line to say a Big Thank You for everything that you did for me and my bridesmaids and my Mum on my Big Day. "Everything was so organised and you made everyone look and feel like a million dollars. All my bridesmaids have commented on how relaxed you made everyone feel on the day. Also, as a group of friends we have never looked so gorgeous!
" Firstly let me apologise for not thanking you sooner. You may remember you saved me by agreeing to do my hair and makeup for my wedding after my original wedding had been cancelled by the venue in Devon. You came to my rescue big style and never had the chance to thank you enough. You truly worked wonders that morning and turned me into a princess, you made me feel a million dollars and all our guests were amazed at how well I scrubbed up! My husband Chris was blown away and I recieved just the reaction I was hoping for. Every girl hopes they look their best ever possible on their wedding day and thanks to you and a great dress I achieved that. Your hair and makeup was stunning and lasted over 18 hours and no touching up was even required. You really are talented and I thankyou so very much and highly reccommend you to everyone. We had the most beautiful day with no hiccups and we are really enjoying married life. Take care sharon and once again thankyou." 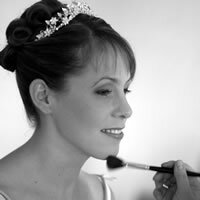 "Just wanted to say a big thank you for the beautiful make up you did for my wedding last weekend. It lasted so well, even through a few tears and we were all so pleased with the results - many of the guests were asking where we had it done! Thanks for making us all feel that extra bit special - it was really lovely." “I just wanted to say a big thank you to you for the fantastic hair & make-up you did for myself, mum and my three bridesmaids; and for your kindness and patience on the morning of my wedding. I just wanted to say a huge thank you for the wonderful hair & make-up you did for myself, mum and bridesmaids on my wedding day. It was a truly wonderful day which started out great in a really calm relaxed manner. Your professionalism shone through, I was amazed at how you organised everyone and we were ready in plenty of time. We had lots of comments all day and the photo’s looked great!" Just wanted to thank you for the make up lesson, I really enjoyed it - you were really helpful and patient! Rather than dreading getting made up, i'm actually looking forward to trying all the new hints and tricks out. I'm off shopping in a moment to stock up! 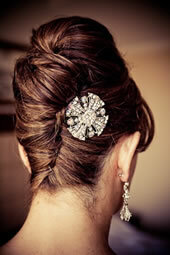 "Thank you so much Sharon for the wonderful job you did on my wedding hair and make up. Not only was a I relieved to see a friendly face when you arrived at the hotel but you kept me nice and relaxed throughout the morning! My make up managed valiantly to hide the fact I had slept for only two hours the night before and my hair was a masterpiece, I had two changes of clothes in the evening and it remained with not a strand out of place. The biggest compliment I could have got was my friend who said 'when you walked down the aisle, your dress, your hair and your make up screamed Hollywood glamour!' which was so much more than I had ever hoped for. Thanks again for all you did, it is really is appreciated."